At Courtyard, we make it our business to know the business travelers. We know that often the real work begins when your office hours end. That's why we offer favorite foods at the 24 hour market, free wireless Internet access to connect you with work and home…the comfort of designer bedding when it"s time for that well deserved rest…and a full-service restaurant open for breakfast with an all-you-can-eat buffet for $8.95. 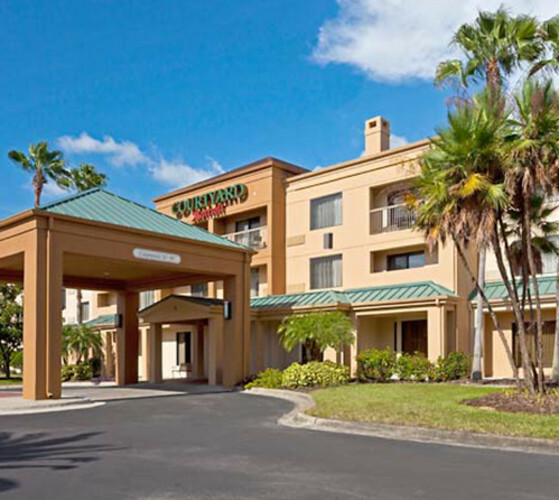 Food & Beverage: Courtyard Cafe offers a full service breakfast buffet with "Eggs cooked to Order". Waitress. $8.95pp including your beverage of coffee and juice. Other Amenities: Indoor pool with Jacuzzi overlooking the outdoor Courtyard.